Starting out from Whitney Portal on the warm, clear afternoon on 28th of July I slowly made my way to Lower Boy Scout Lake, elev. 10,360 ft., via the mountaineer's route to Mt. Whitney. This lake is really only a shallow pond. Practically a puddle. I imagine that in 100-200 years it will be just a flat spot in the meadow. The next day took me up past beautiful Clyde Meadows, past Boy Scout Lake and then up the sandy slopes (class 2) to the Russell-Carillon plateau where I spent the night at approx. 12,910 ft. on the plateau itself. By keeping the pace fairly slow I managed to acclimate while ascending the continous steep grade. Having never done this before, it seemed to have worked pretty good. No headaches, loss of appetite, or nausea. After dropping the 45 lb. pack on the crest of Russell-Carillon pass, elev.- 13,300 ft., on the morning of the 30th, the adrenalin kicked in while ascending the exposed, 3rd class, east ridge of Mt. Russell. Contrary to other trip reports I've read, the mysterious "mantle move" crux is/was bypassed by dropping off to the right, (north) side of the ridge. I managed to avoid this obstacle on both my first climb in 2010 as well as this time. The knife edge ridge between the east and west peaks briefly narrows to 2 ft. in spots but the right (north) side always has something to fall back to when the ridge itself becomes too much to handle. Checking my Garmin on both summits, it noted only a 2 ft. difference between the height of the 2 peaks, the west peak being slightly higher. Upon descending back to Russell-Carillon pass I was now out of water and still had to descend the steep class 3 north side of the pass to reach water at Tulainyo Lake. Carrying a full pack, the first 100 ft. down began steep but then gradually lessened to a managable, blocky and slow boulder hop. Once at the lakeshore, the gnats and endless talus erased plans of camping on it's shores. Too bad, but sand is "extinct" here. After filling water bottles I reluctantly went on and pitched my tent on the sandy southern slopes of Tunnabora Pk. at about 13,100 ft. The next morning I climbed to the summit at approx. 7:50 AM. The early morning shadows made the views sharp and clear. After taking pictures I headed down to the upper Wallace Lakes basin, elev. 11,880 Ft. pitched the tent, and rested for the remainder of the day. There was an hour long hale storm during the night and I found water in the bear cannister the next morning. My lightweight single wall tent withstood the pelting with no damage though. The next day, Aug. 1, I started up the steep class 3 west slopes of Mt. Carl Heller. My only "beta" was a photo or 2 from Bob Burd's trip report and R. J. Secor's descript of the route (3rd edition). Everything went fine until 50 ft. below the summit where the "ledge wrap around to the summit" ended prematurely at a vertical block of granite. At this point it appeared that both the south ridge and the ledge ended at vertical standoffs. It took some time to discover a faint "switchback" crack system that leads steeply away at the vertical block where the ledge ends. It involves maybe 2-3 upper 3rd class moves and at the top there was a sling installed by previous climbers. I didn't use or need it myself. From that point on, it was easy, obvious, and short to the summit. Future climbers should note that switchback where the summit ledge ends and save themselves some unnecessary time and anxiety. It's not detailed in the Secor guide but perhaps should be. The next day I went down to Wallace Lake proper and up the easy class 1-2 slopes to Mt. Barnard. At elev. 13,990 ft. it's listed as the highest 13er in California but, unlike Mt. Whitney, hasn't been recalibrated for some time. I took along a GPS for curiosity's sake. I can't confirm the accuracy but the readings on the GPS drifted between 14,002 and 14,012 ft. of elevation. It seemed to hone in at 14,005-14,008. I thought about contacting USGS but haven't done it as of yet. Perhaps in a day or so I will. As I descended Mt. Barnard an intense cell of moisture was drenching the Kaweah's. I caught the edge of it, but returned to camp without getting wet. With the assistance of a full moon, I packed out of Wallace Lake at 4 AM on Aug. 3rd and reached Whitney Portal about 4 PM. Had an absolutely wonderful trip. 1) The 1984 USGS topographic map shows an elevation of 4264 meters at the summit. That figure is followed by the letter "T" as seen below. The letter "T" indicates this elevation was derived from the examination of aerial photographs and was not obtained from surveying instrumentation, so it's somewhat imprecise. 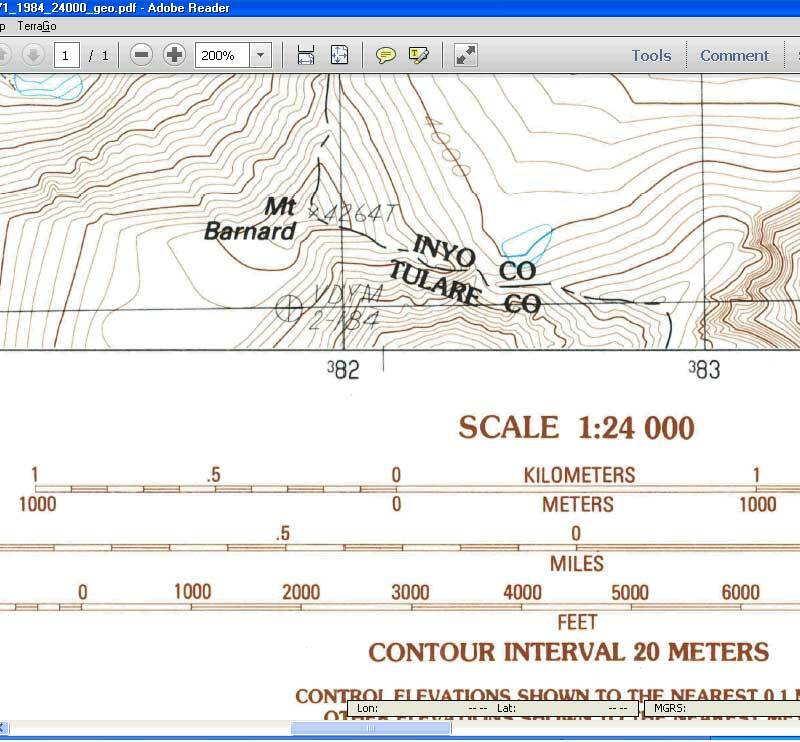 The tolerance for these elevations is 3/10ths of the map's contour interval - 20 meters in this case. So the true summit elevation lies somewhere between 4258 meters and 4270 meters (13,970 and 14,009 feet respectively). We checked to see if there is any additional elevation control in our records and in the National Geodetic Survey's records, but there is none. So the 39-foot range of imprecision is the best we've got. 2) The accuracy of GPS-acquired elevations can vary considerably. The general rule is that vertical error is roughly 1.5 times as much as horizontal error. In other words, if your horizontal accuracy at the time of acquisition was 10 feet, then your vertical accuracy was roughly 15 feet. This can change from minute-to-minute in response to satellite movement and atmospheric conditions, as you observed with the 10-foot variation you mentioned. 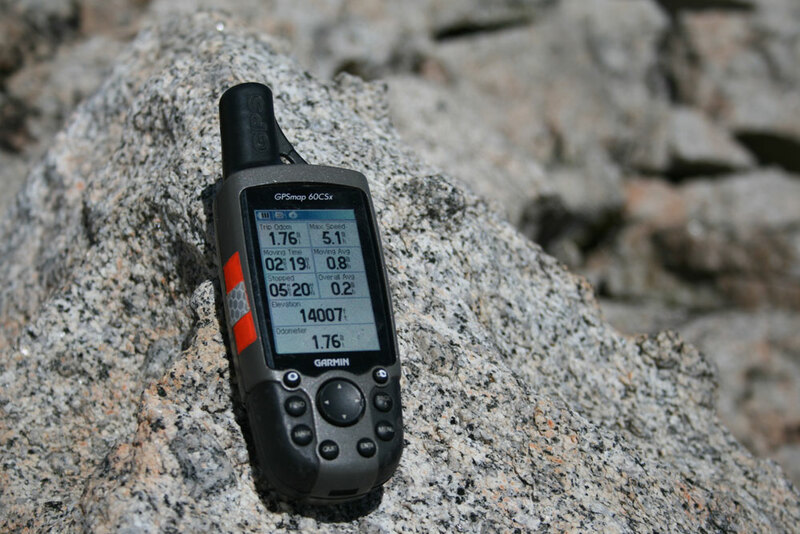 It is possible to get extremely accurate elevations from a GPS, but it requires a very expensive receiver, a lot of post-processing of data, and assumes there is a control station (very precise vertical point-of-reference) in the vicinity. So Mount Barnard may indeed be a 14er. But it would require a considerable investment in equipment and expertise to ascertain this - something there is no compelling reason for. Contrary to popular opinion, relatively few summit elevations have been precisely measured. We appreciate your offer to share your information. We use GPS-acquired data for some features that appear on our new US Topo maps, but the typical horizontal imprecision of 20 feet or so is acceptable. If you have additional questions, feel free to respond.